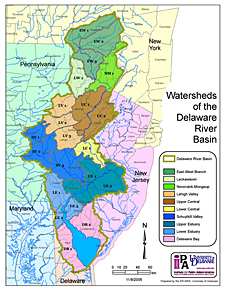 9:19 a.m., Nov. 18, 2008----A recent report on the state of the Delaware basin is the most comprehensive scientific evaluation of the health of the 13,000-square-mile watershed to date, thanks to a collaboration of land-grant institutions in the four states that share pieces of the watershed, Delaware, Pennsylvania, New Jersey and New York. The report culminated a three-year, $145,000 project funded by the Delaware River Basin Commission (DRBC) and the Partnership for the Delaware Estuary. Led by the University of Delaware Institute for Public Administration's Water Resources Agency (IPA-WRA) in the College of Human Services, Education and Public Policy, the research consortium also included Rutgers University, Cornell University and Pennsylvania State University. Principal University of Delaware researchers included Gerald Kauffman, director of the IPA-WRA, and Andrew Homsey, GIS services manager for the IPA-WRA. Also contributing to the report were graduate students Andrew Belden (Center for Energy and Environmental Policy), Kevin Vonck and Angelina Micheva (School of Urban Affairs and Public Policy), and undergraduate students Christi Desisto (Department of Civil and Environmental Engineering), and Laura Yayac (Department of Food and Resource Economics). Jerome Lewis, associate professor in the School of Urban Affairs and Public Policy and director of the Institute for Public Administration, and Tom Sims, T.A. Baker Professor of Plant Science, associate dean of the College of Agriculture and Natural Resources and director of the Delaware Water Resources Center, provided funding for graduate and undergraduate student research assistantships to staff the project. In the 1950s, the Delaware River at Philadelphia was called “one of the most grossly polluted areas in the United States.” Oxygen levels in the water plummeted to zero during the summer months. Since then, environmental laws have led to what some scientists call a resounding revival for the waterway. Water quality as measured by dissolved oxygen, phosphorus, lead and zinc levels has improved in most tributaries since 1990. Delaware and New Jersey are partnering on an oyster restoration project that has planted 500,000 shells on reefs in the bay. Watershed groups are removing dams that have been an impediment to fish migration. Over 1,600 federal Superfund sites are being cleaned up. Blue crab landings are up, resulting in a $7-million economy. Bald eagles are back with more than 50 nesting pairs in the basin. Forests cover more of the basin now then during the 1930s, although there was a decline in forest acreage between 1996 and 2001. More than 400 miles of rivers in the basin are included in the National Wild and Scenic River Program. The pesticides atrazine and metolachlor have been detected in eight out of 10 basin streams. Fish-consumption advisories remain on 4,000 miles of streams. About 10 percent of the streams are designated as “impaired” by the U.S. Environmental Protection Agency. The red knot, a shore bird that gorges on Delaware Bay horseshoe crab eggs during its spring migration from the tip of South America to Canada, is closer to extinction. About 15 percent of habitat for brook trout, the state fish of New Jersey, New York and Pennsylvania, has been extirpated. The Atlantic sturgeon is teetering on the brink of extinction. Only two fish per haul were caught in the Delaware in 2004 and none in 2005. Between 1996 and 2001, the Delaware Basin lost 18 square miles of agricultural land, 4 square miles of wetlands, and 48 square miles of forests, while gaining 70 square miles of urban/suburban land. Major floods occurred along the Delaware River in 2004, 2005, and 2006, damaging hundreds of homes. For more information about the health of the Delaware watershed, river and bay, download PDF versions of the State of the Delaware Basin report or the State of the Delaware Estuary 2008 report of the Partnership for the Delaware Estuary.